Join The Fun Of Stampin Up's Sale-A-Bration 2010. You Could Earn Four Free Stamp Sets. We all love to receive free goods, and the Sale-A-Bration free stamp sets will give you many hours of creative fun. This year Stampin Up has produced four beautiful sets, that hostesses, customers and demonstrators can earn. How can YOU take part in this exciting promotion? It's really very easy, and can be done in a number of ways. Take a look at both the 2009- 2010 Idea Book and Catalogue and the current Summer Mini Catalogue and update your wish lists. Each customer order totaling $100.00 or more (excluding P&H) lets YOU or your friend choose one of the four free stamps in the Sale-A-Bration catalogue. $200.00 orders = 2 free SAB sets. Remember though that the 5% Postage and Handling is not included in the order total for the free stamp set(s). Contact me for your FREE SAB Catalogue here. If you have questions or would like to place an order -Contact me here. Please note that these orders are only available to Australian residents. That doesn't mean you can't be inspired by the examples to create your own versions of the card templates or scrap pages, using different stamp sets available in your own country. Here is an example of cards made using my one pre-ordered SAB stamp set. I've combined the house images with different sheets from the exquisite and very popular Kaleidoscope DSP available in the current Summer Mini Catalogue - so why not make that 1st on your order Wish List? I've used my trusty White Gel Pen to add extra pattern to the already intricate patterns of the DSP. 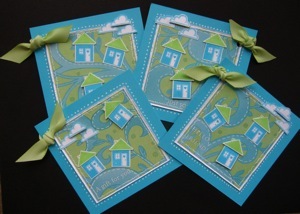 The houses were inked up using the Stampin Write Markers. The variety of cards and other items that can be made with just these couple of items is endless - mainly because the DSP has such a variety of patterned papers in the set. The very best way to find out about SALE-A-BRATION 2010 is to contact me and arrange a workshop. I can show you lots of ideas, so you'll get the best value out of your purchases and FREE stamps. If you can't find the time to either attend a workshop or host one of your own you are very welcome to place a customer order to the value of $100.00 or more. Remember every $100.00 spend earns you another FREE stamp set from the SAB range. Place an order with me and enjoy using these sets to create lovely cards and scrap pages. If you would like to learn more about Sale-A-Bration, contact me. Return to Ann's Stamping and Scrapbook World Home Page.